Nurses have turned out in force for the third of eight planned work stoppages. Credit: Irish Nurses & Midwives Organisation / Facebook. Singer and Bray-native Hozier penned a message on Twitter urging followers to support the nurses in their strike action. Hozier’s backing came ahead of today’s third round of stoppages at hospitals and health centres nationwide, including Loughlinstown and Greystones, in an effort to force concessions on conditions and pay from the government. “I hope everyone in Ireland shows support for nurses during their strike action,” wrote the music artist. More than 37,000 nurses are taking part as the labour dispute extends through its second week. Some of Hozier’s 700,000 Twitter followers were quick to express their gratitude. “From the bottom of my heart I wish to thank you for your lovely words and support,” tweeted one nurse. “See you at the Dáil on Saturday,” she added, referring to a planned rally outside government buildings. We get a few nurses in work, I'm a beautician. There's one in particular, a midwife, has posted that she had to look after 21 mothers and 9 babies in a shift last week. That's alot. We are now offering luxury pedicures to midwives and nurses to take the load of their feet. As a result of the strikes, all outpatient, inpatient, and day surgery was cancelled today along with community nursing services. The nurses’ second 24-hour strike, on Tuesday, led to up to 50,000 appointments being dropped. 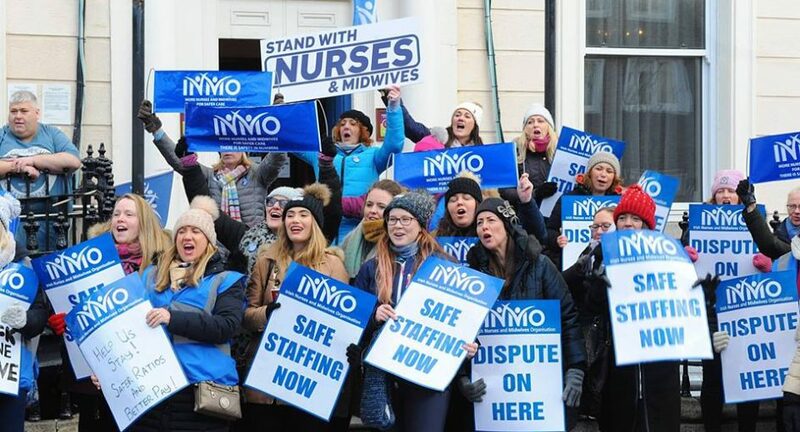 Leaders of the Irish Nurses and Midwives Organisation (INMO) say they have received no direct communication from the government and that nurses remain resolute. The INMO has planned five more stoppages throughout February. The Taoiseach told Fine Gael party members this morning that the government would seek a mechanism in the coming days through which to resolve the dispute. According to the government, accepting the INMO’s demands would result in pay increases of up to 40% next year for some, and an increase in newly-qualified nurses’ salary from €29,000 to €40,000. Last month, a survey by iReach found that 64% of Irish people were behind nurses in the strike. 87% of those polled said that they thought the government can do more to retain and recruit nursing staff.